New Attractions Coming to Sky Zone Fort Myers Trampoline Park Dec 1 Offering Even More Indoor Family Fun! Looking to add more adventure to your next family outing? Sky Zone Fort Myers offers just that with a host of indoor activities that the whole gang will enjoy. The inventors of the first indoor trampoline park designed this venue to have something fun for everyone at any age with trampolines and ten core activities including the Foam Zone, SkyHoops, and Ultimate Dodgeball. As if there weren't enough options lending to hours of family fun, Sky Zone will be introducing eight new attractions this winter! Read on to find out more about the exciting new adventures awaiting you and your family at Sky Zone in Fort Myers! Fans of Wipeout will be stoked to try this new attraction of the same name where a giant, spinning sweeper arm tries to knock over eight players. The last one standing wins! 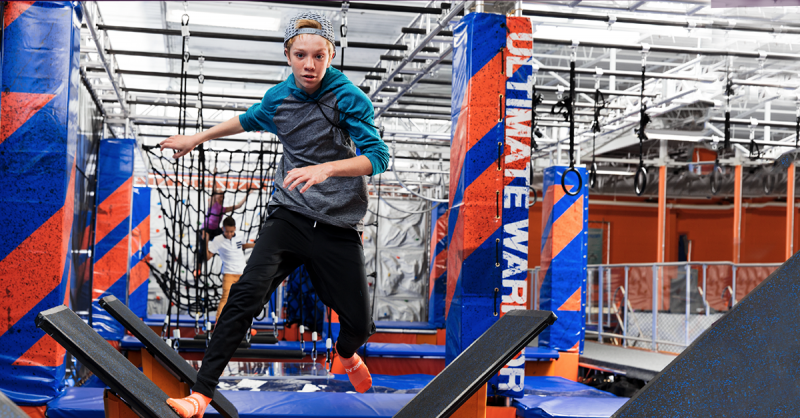 Experience another cultural phenomenon and put your parkour skills to the test at Sky Zone's Freestyle Court made of foam vault blocks. At this new attraction, you'll either find victory or a soft landing. Inspired by aerial fabric acrobatics, Silks allows you to climb, spin, and swing not over a crowd but a foam pit. Your options are as endless as the aerial stunts you can dream of! Yes, your family will also be able to zip line at Sky Zone Fort Myers! Zip lining has always been popular, but it's never been more fun here as you'll zoom down the zip line and land in foam pit. 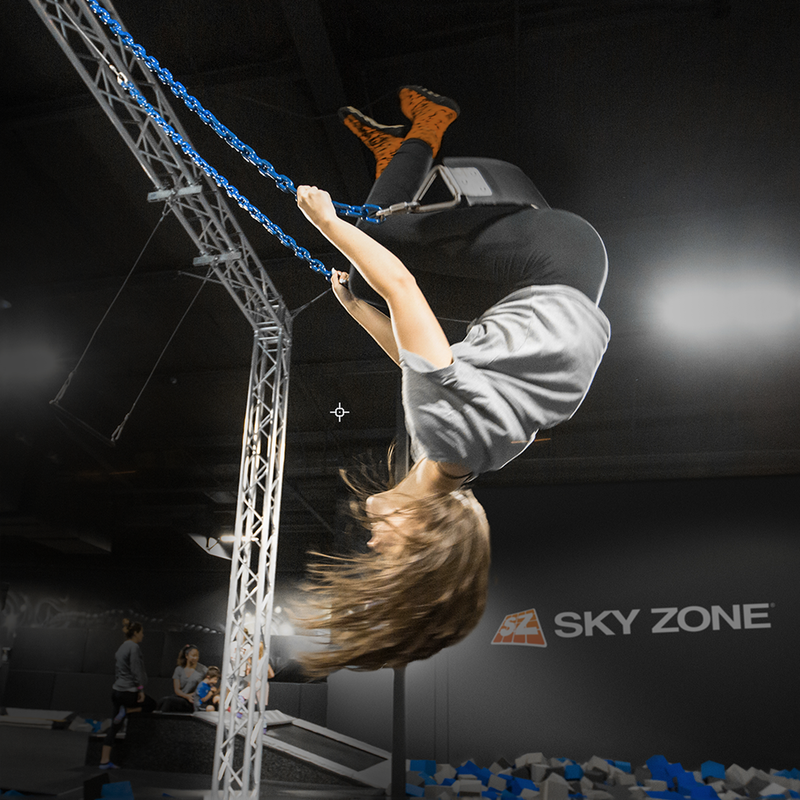 This new attraction at Sky Zone gives you the chance to trapeze and swing like you're under the Big Top. When you've reached you're highest point, you can let go, soar, and fall into a foam pit for the grand finale! We've all heard of free falling, but Sky Zone lets you do just the opposite with their new attraction, Freeclimb. 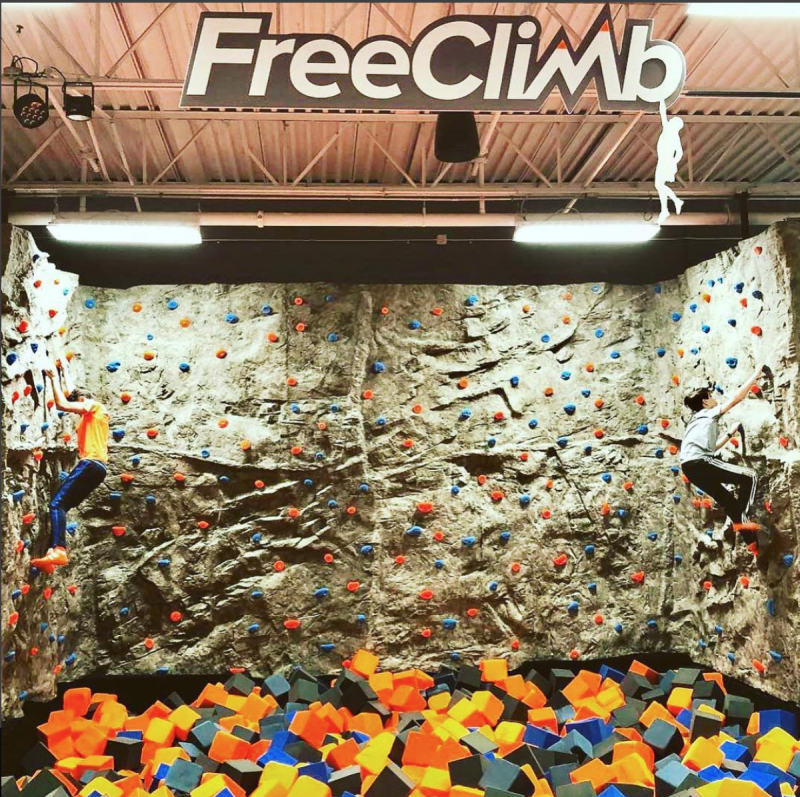 Without a harness, it's just you and the rock wall plus a foam pit to break your fall if you let go. 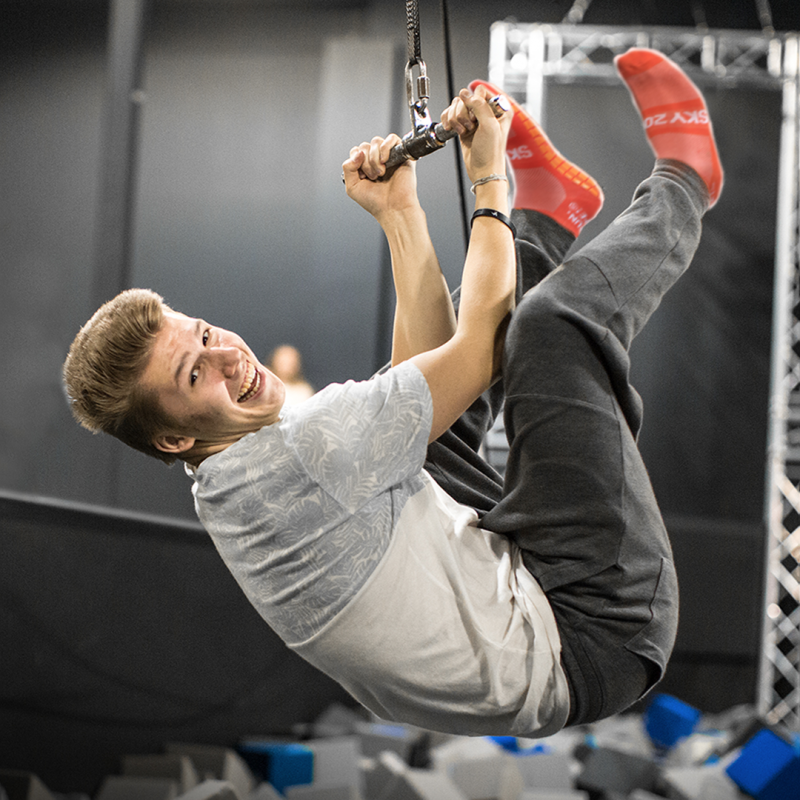 Aspiring American Ninja Warriors will love this new attraction at Sky Zone Fort Myers where they can push their physical limits and take on a variety of challenging obstacles. Who will be the champion in your family? Cross over into the Drop Zone and try new tricks, get big air, or pose mid-air for photos before landing nicely in a soft foam pit. Sky Zone Fort Myers also has fun events lined up for the season with a Fortnite Tournament and Thanksgiving GLOW on Tuesday, November 20! Kick off your Thanksgiving break by battling in a Fortnite Tournament at 6 p.m., then jump around amid black lights and laser beams from 8 p.m. to 12 a.m. For details and tickets for these events as well as activities (core and new), visit the Sky Zone Fort Myers website. 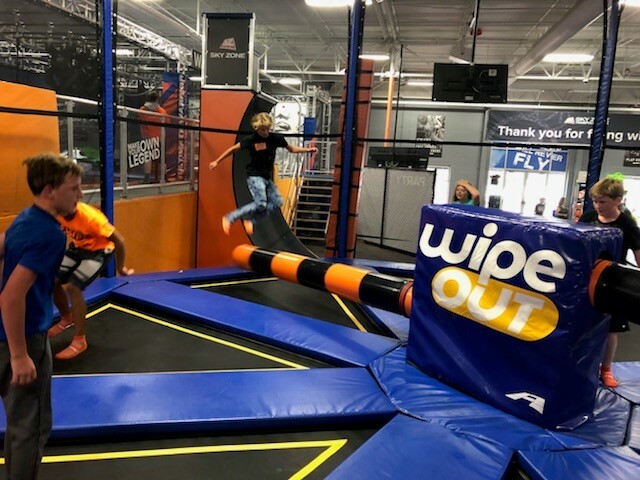 Sky Zone Fort Myers offers plenty of fun activities for kids and adults alike, so bring the family here for a fun day indoors and discover all the new attractions coming to the trampoline park this winter. Find more fun things to do in Fort Myers and register on 239area, your free guide to the Fort Myers area!